Looking for long-burning candles that fill a room with scent, not smoke? You've come to the right place! 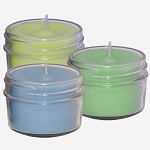 Soy jar candles bring peace and ambiance to any room, and at Friendly Fumes, we make the best. Our hand-poured soy candles are made of 100% pure soybean wax. Soy wax has a long-lasting, clean burn, and we don't interfere with that by adding paraffin or other fillers that can create thick black soot and heavy smoke. Of course, pure soy wax does generate a small amount of soot (as everything that burns must), but it's so minimal as to go unnoticed. You won't find a black build up on the rims of our soy jar candles! To further minimize soot production, the wicks in our soy jar candles are never cored with metal. Instead, we use hemp-cored wicks, braided with unbleached cotton grown right here in the U.S. Thanks to our pure soy wax and clean wicks, Friendly Fumes soy candles are 95% soot free—that's something to get lit up about! 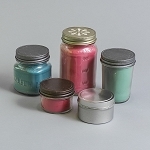 We make an assortment of pretty, colored handmade candles that complement a room, but we also offer dye-free soy candles scented with pure essential oils. Place a few around the room to fill it with gentle aromatherapy, creating an inviting, rejuvenating ambiance you'd pay big bucks for at a spa, right in your own home! We also have candle shades to help you get your lighting exactly right. Our soy jar candles can turn your room into a sanctuary, and we can't wait for you to experience them. 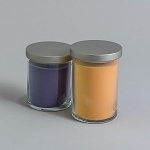 In addition to essential oils, we offer nearly 300 fragrances to personalize your soy candles. Choose a color and scent that speaks to you. Something light and fruity? Dark and woodsy? What about a unique scent like leather to fill your room with that "new car smell?" We even have a scent specialized for sinus relief, so you can breathe better too. Go on and nose around! 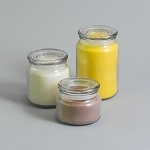 If you just love the look of candles and prefer to distribute scent around your home another way, we offer unscented soy jar candles too so you can bring the beauty of our candles into your home, without the fragrances. Friendly Fumes offers so many varieties of soy jar candles you can find something for every room, every home, and any style of décor. 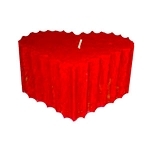 Browse our catalog, and we're sure you'll find our handmade candles as perfect and unique as your home! We carefully infuse pure essential oils and fragrance oils into pure 100% soy wax with no additives. Our fragrant oils are custom made to our specifications to ensure a clean, long burning candle. Our Eco-Friendly fragrances are free of phthalates, glycols, solvents, para bens and sulfates... healthy for both you and our environment. We carefully infuse pure essential oils and fragrance oils into pure 100% soy wax with no additives. Our fragrant oils are custom made to our specifications to ensure a clean, long burning candle (Packed in Brown Craft Box). We carefully infuse pure essential oils and fragrance oils into pure 100% soy wax with no additives. Our fragrant oils are custom made to our specifications to ensure a clean, long burning candle. Place our Soy Wax tarts on a tart burner or potpourri pot and enjoy the scent. Save Money! Order our 4 Ounce Soy Candle Variety Pack and You Choose the Scents — Approximate burn time is 30 hours. We offer both 'Rust' and 'Black' colored Candle Shades (Available as shown). 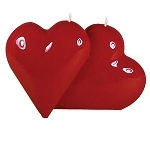 Both Candle Shades will fit all of our Soy Candle Jars.